Below I am showing a scheme that involves the monomer of A-beta peptide interacting with tabersonine. The evidence in the paper points towards the preferred interaction between tabersonine and the aggregated form of peptide, but it is easier to draw the monomer. While there is no real chemistry in this paper (and why should there be if you can get your Voacanga africana beans? ), I did recall one of my favorite syntheses of tabersonine. It was published by my good old friend S. Kozmin (now at the University of Chicago) when he was a graduate student in Viresh Rawal’s lab. 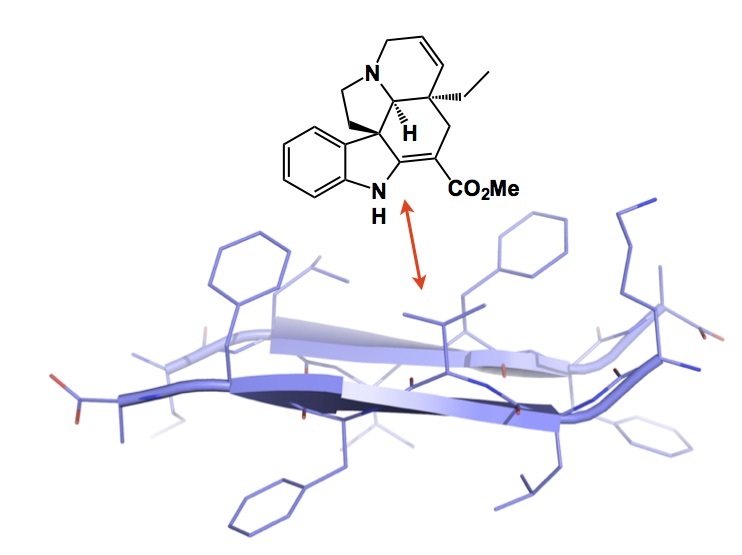 The paper features a Diels-Alder approach to the central ring and makes use of the amine variant of the Danishefsky’s diene, developed by Rawal and Kozmin at the end of 1990’s. Coming back to the disruption of amyloids, I am not sure tabersonine will see any sort of medicinal use, although it is encouraging to keep in mind that alkaloids are often very blood/brain barrier-permeable. Maybe nature is indeed trying to tell us something here?